Our confit pork belly was a great success last week. 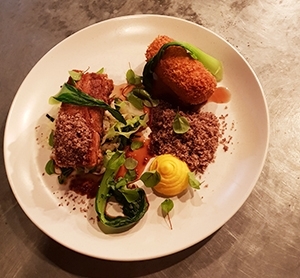 Slow cooked pork belly was served with Black Pig croquette, smoked roots pureé, pak choi, apple and mustard greens. The Black Pig croquette is made from potato and black pudding made by our neighbouring traditional butcher – The Black Pig.